The Eliza Bryant Village Caregiver Support Group provides a safe space for caregivers to connect with new friends and learn tools and resources for coping with stress, anxiety and caring for aging adults. Our Caregiver Support Group meets on the fourth Thursday of every month at 6:00 p.m. These meetings are open to the public and we invite you to join us to connect with our professional guest speaker, staff and view our center. Respite is available upon request. Dinner is provided. If you have any questions or would like more information, please contact Elizabeth Parker, Adult Day Care Social Worker, at (216) 658-1884. 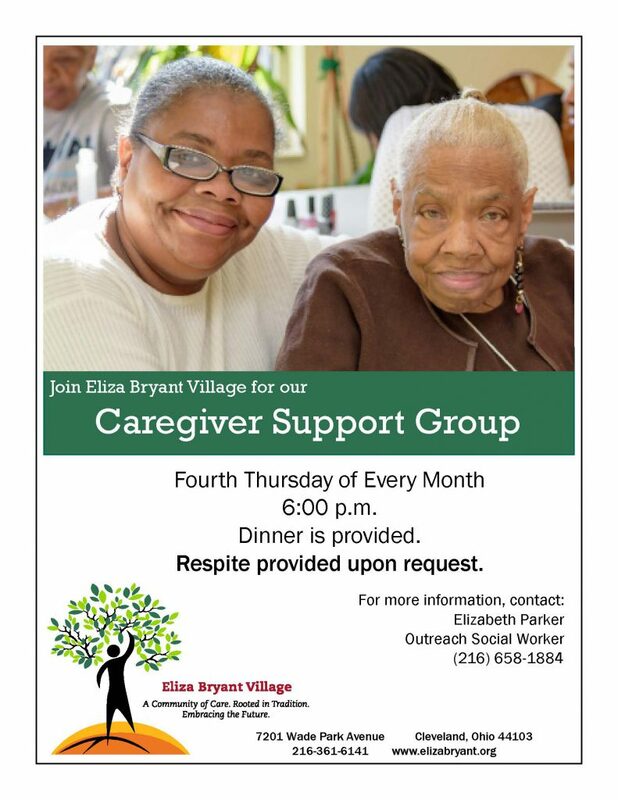 Do I have to have a family member enrolled in Eliza Bryant Villages’ Adult Day Care & Senior Outreach Program to attend the Caregiver Support Group? No, you do not have to have a loved one currently enrolled in Eliza Bryant Villages’ programs to attend a meeting. Our Caregiver Support Group meetings are open to the public. No, our Caregiver Support Groups are free. What should I expect at the Caregiver Support Meeting? You should expect kindness, support, education, compassion and confidentiality at our Caregiver Support Meetings! When you arrive, our staff will welcome you and guide you to the correct meeting location. Our Social Worker, Ms. Elizabeth Parker, will provide a welcome and overview about Eliza Bryant Village’s Inez Myers Adult Day Care & Senior Outreach Programs, as well as additional Village services. She will then allow attendees to introduce themselves followed by an introduction of the guest speaker. Our guest speaker will proceed with either a brief discussion or an activity. The remaining time is allowed for questions and group discussion.